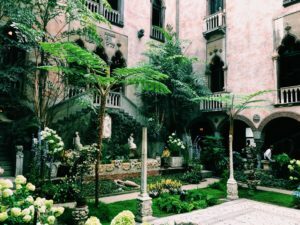 While on a trip to Boston, Massachusetts with my mom, I had the chance to visit the Isabella Stewart Gardner Museum. While wandering through the seemingly endless collection of artifacts, furniture, decorations and artworks from all around the world, I became so inspired to learn as much as I could about this fascinating woman. Isabella Stewart Gardner was originally born in New York City on April 14th, 1840. Her father made a fortune importing Irish Linen and investments. Isabella went to a private school in New York and finished her schooling in Paris where she met John Lowell Gardner Jr. They later married in New York City and moved to Boston. In 1863, they had a son who died of pneumonia at just two years old. In attempts to bring Isabella out of her depression from losing her son, Jack Gardner took her on a trip to Russia and Europe. This was the beginning of many trips and adventures the two would take over the years, including Egypt and the Middle East in 1874-75 and Asia from 1883-84. Not only did Isabella collect amazing treasures along her travels but she also wrote extensive journals. In 1878, Isabella met Charles Eliot Norton, who was the first professor of art history at Harvard University. He inspired her to start collecting rare books and manuscripts. She started with the early editions of Dante. The pair then visited Venice in 1884 where Isabella visited Palazzo Barbaro, which became a huge inspiration for her and her museum. Sadly, in December 1898, Jack Gardner died of a stroke. But just six weeks later, Isabella continued with their plan to buy land in the Fens and build a museum of their collections. Willard T. Sears was picked as the architect. Construction for the Isabella Stewart Gardner Museum began in 1899 and finished in 1901. Collections of paintings, sculptures, tapestries, furniture, manuscripts, rare books and decorative arts were installed. 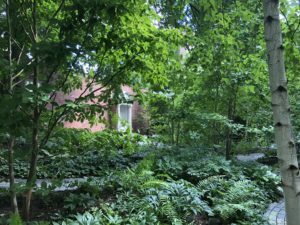 The museum’s grand opening was January 1st, 1903, paired with a concert by the Boston Symphony Orchestra and the grand opening of the interior courtyard garden. The museum was open to the public the following month. Although the museum was already opened, Isabella continued to collect artwork and work on the installations for the rest of her life.